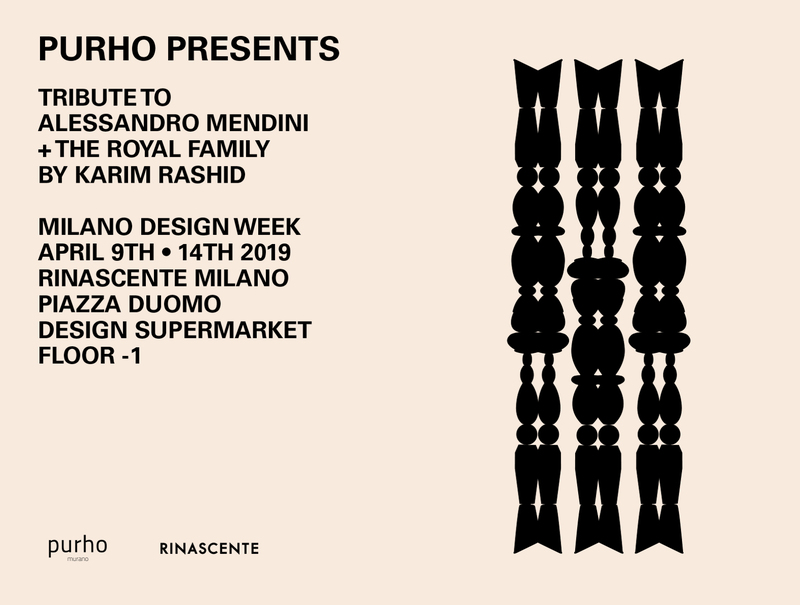 On the occasion of Milan Design Week 2019, Purho will exhibit in the spaces of the Rinascente Milano Design Supermarket, floor -1 a selection of Murano glass vases signed by two great names in design and architecture, Alessandro Mendini and Karim Rashid. To commemorate the first, extraordinary interpreter of the world of international design, Purho was glad to accept the invitation to exhibit some works created in 2015 by the Milanese architect and designer in the context of an exhibition paying tribute to his inexhaustible career. The Gemella and Gemello vases and the Freccia vases will be presented at the Design Supermarket in both the large and small versions. Karim Rashid widens the field of action to represent an entire Royal Family composed by the vase King and Queen, Kount and Kountess and the trusty Knight.